As previously mentioned, I’ve just spent a nice holiday away from it all in Iwate Prefecture in the North/Tohoku Part of Japan, in Morioka more precisley! Although Iwate Prefecture does not have as long a seashore as in Shizuoka, it’s nonetheless noted for its fisheries, especially sanma/Pacific saury! As it comes absolutely fresh in that Prefecture, it is best savored raw in season (right now) when it is “fat”. We ate the above in a great little izakaya in Morioka City. The fish was cut in almost paper-thin slices and served with grated ginger, momijioroshi/grated daikon with chili pepper and finely chopped thin leeks to be dipped into soy sauce. A must for sashimi officionados! 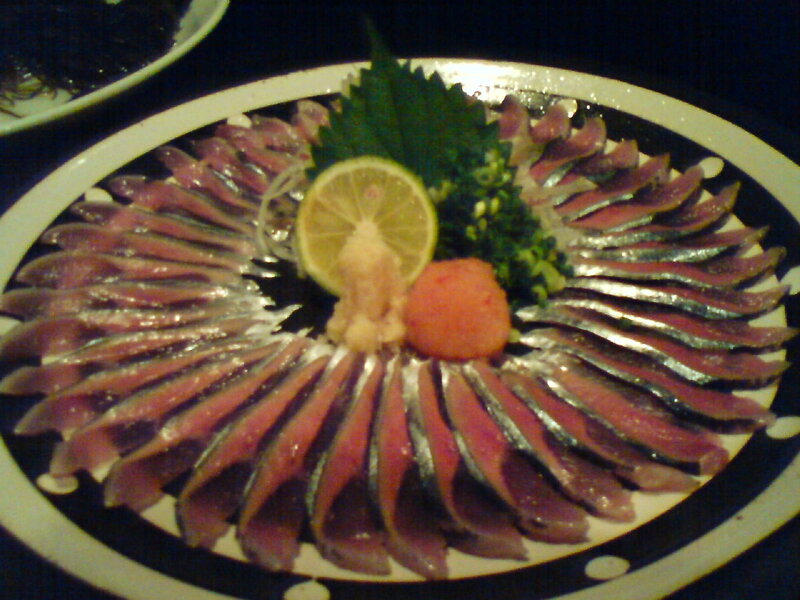 Sanma is truly wonderful raw fish. If you like Spanish Mackerel, this is a must! Much more like Spanish Mackerel ( Aji) than like Japanese Mackerel (Saba). I like Saba. I adore Aji. PS Thanks for doing this site. I love sashimi, but there is always room for more learning (and more sashimi)!